I just got back home after spending two weeks with my mom...I love love love the time I got to spend with her and my family, but there is something to be said for being home and running our little house. I crave the structure that our routine brings...its not that I'm not flexible, but I'm much more efficient when I have reliable schedule! 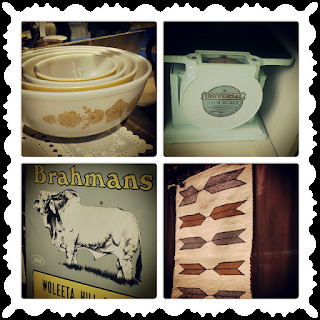 While I was at my mom's we did some antiquing in Longview and we hit up the Portland Antique show! I spotted several things that really needed to come home with me...but with a limited budget...and limited car space I settled for taking pictures instead. Isn't the one with the metal siding as a backer just awesome!! 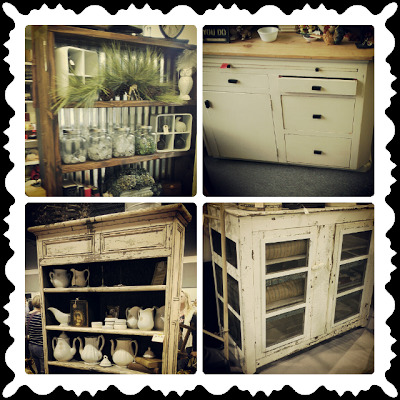 I totally would take any of these...I think the hubby better watch out...ideas are bouncing around in my head! I meant to go back for this set of Corelle bowls, but I forgot them...totally kicking myself for that one! They are just a bit different than any of the three sets I currently own. I happen to think you can never have too many sets of mixing bowls. I really wanted the old scale, but when I realized that it didn't have its original paint I couldn't justify paying the price they were asking...and I am kinda picky about leaving the original finishes on some things. I like the character it provides. I was gaga over this giant cow sign...it was ONLY $750.00...a total steal, right? haha! I have big plans to recreate it somehow! I was also was swooning over this native American textile...but sadly it was just out of my budget. 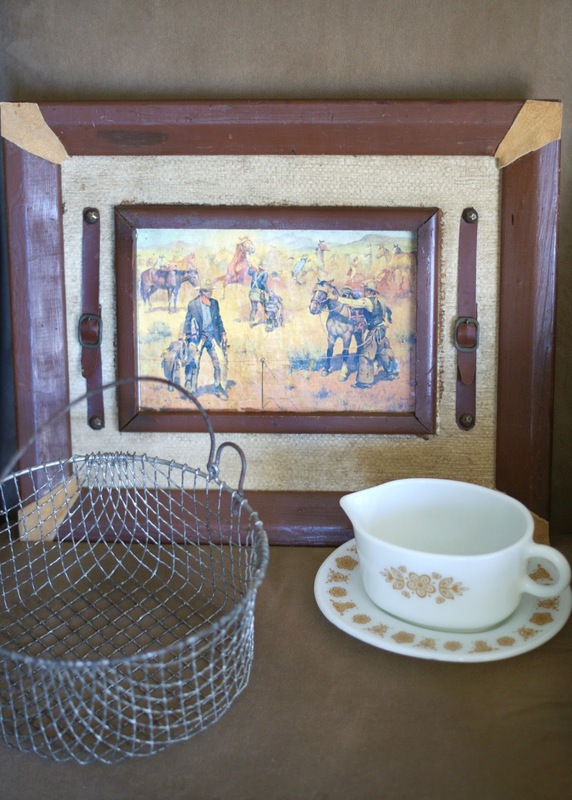 ...a funky and borderline tacky cowboy art piece for $15. It will fit perfect in Ever's baby room! ...and a Corelle Butterfly Pattern gravy boat and plate for $16- a piece I was missing from my collection! 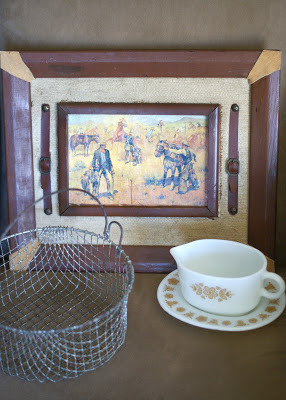 I love being inspired by antique and vintage items. 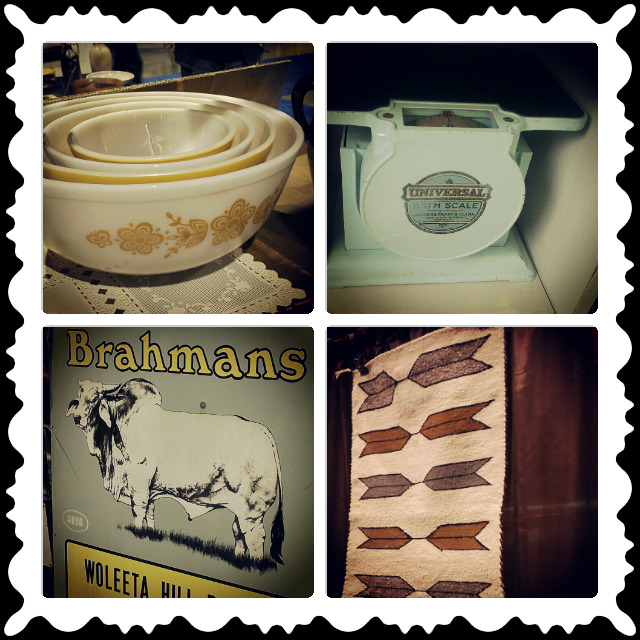 Antiquing was so fun! You got cute stuff! Love the picture! I wish I had known you wanted those bowls..we could have gotten them for you when we went back the next day! It was fun! Everyone got such cute stuff! Glad you went back for the hula girl! I saw! You're just too kind! I just put up my post and will be linking it back to you! Thank you!!! It was so fun checking out the shops and show!